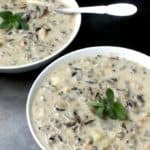 A creamy Mushroom and Wild Rice Bisque that's healthy yet decadent tasting. Vegan, gluten-free, soy-free and can be nut-free. Place the wild rice in a saucepan with 4 cups water. Bring to a boil, lower heat to a simmer, cover and cook 45 minutes. Drain. If using dry mushrooms, soak them in 2 cups hot or boiling water for at least 30 minutes. Drain and reserve the stock. Blend the cashews with 1/2 cup vegetable stock into a very smooth paste. Heat the oil in a saucepan. Add the onions, garlic and celery. Season with salt and pepper and saute until soft and translucent. Add the mushrooms with the wine. Cook until the wine has evaporated, stirring frequently. Add the herbs and the vegetable stock and the reserved mushroom stock. Bring to a boil, cover and cook 10 minutes. Remove half the soup to a blender and blend until smooth. You can blend up to 3/4th if you want less texture in the soup. Return the blended soup to the pot with the rest, add the drained wild rice, and cook another five minutes. Season with salt and pepper to taste. Stir in the cashew cream, warm through, and serve hot. For a nut-free version, blend 1/4 block of soft silken tofu (about 3 oz) with enough water to make a smooth paste.